(April 4, 2018) – Lionsbridge FC, the new PDL soccer team that kicks off next month at POMOCO Stadium, has partnered with Frog-Skin, the Peninsula-based startup that aims to help athletes of all ages and abilities to better treat soft-tissue injuries. As part of the partnership, Frog-Skin will supply its innovative product, designed to immediately treat soft-tissue injuries, to the Riverside Health System Sports Medicine and Lionsbridge FC. 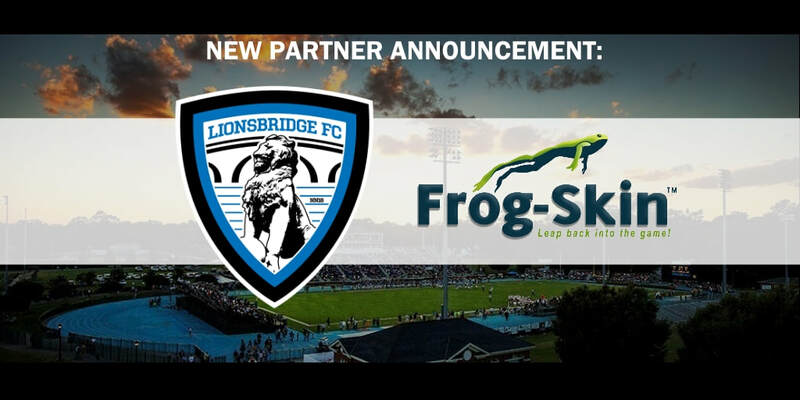 “We are proud to partner with Lionsbridge FC and to provide the Riverside Athletic Training staff with Frog-Skin products. We are committed to serving the Virginia Peninsula community,” Frog-Skin CEO Brian Stewart said. “Brian has created a unique product with Frog-Skin that will have a positive impact in injury management. His generosity will allow us to utilize his products when treating our club players, and I look forward to continue working with him as he grows Frog-Skin,” said Riverside’s Kristian Hill, head athletic trainer for Lionsbridge FC. Lionsbridge FC will play its home matches at POMOCO Stadium on the campus of NCAA Division III powerhouse Christopher Newport University. Each home game will be preceded by a two-hour pre-game community festival complete with supersized bounce houses, craft beer, a rotation of local food trucks, music and family entertainment. The Premier Development League (PDL) is the top pre-professional league in North America and consists of more than 70 teams across the U.S. and Canada, functioning as Major League Soccer’s primary developmental and player showcase platform. Frog-Skin joins an extensive network of Lionsbridge FC partners that includes Chick-fil-A, Riverside Health System, Nike, Tradition Brewing Company, Mosquito Joe, Whole Foods Market, K9 Off Leash Dog Training, Kona Ice, O’Doodledoo’s Donuts, All-Pro Tactical, Vinny’s Pizza, Kwolity Productions, Parkway Printshop, Clancy and Theys Construction Company, Animal Medical Care Center of Yorktown, the law firm of Jim McNider and Onelife Fitness, as well as numerous area youth sports organizations such as Baystars FC, Churchland Soccer League, Newport News Parks & Recreation, Premiere Sports, Smithfield Soccer Club, Suffolk FC, Tidewater Sharks, Upward Sports in Hampton, Virginia Legacy Soccer Club, VIP United and Yorktown FC. Frog-Skin is on a mission: to vastly improve the immediate field treatment of soft-tissue injuries. Inspired by the needs of young athletes, our products empower customers with the same quality of care found in elite athletic trainer facilities. Frog-Skin materials enhance ice therapy by keeping your skin at a safer therapeutic temperature. Our ultra-soft, latex-free materials are naturally comfortable with a tremendous degree of compression control. Combined comfort, temperature control and adjustable compression allow continued use for up to two hours. No more 15 minutes on-off. No more burning, aching or numbness. Our simple, intuitive design allows anyone to apply Frog-Skin properly; parents, coaches, or adult athletes. Our reusable products are affordable, accessible, effective and comfortable. Frog-Skin is also perfect for home therapy, follow-up care, or treatment of chronic and overuse injuries. Use Frog-Skin 43 for maximum therapy, or Frog-Skin 64 for cold-sensitive patients. Whatever you iced before, Frog-Skin makes it better. All of Frog-Skin’s tape products are manufactured at Versability Resources in Hampton. A partner since our beginning, Versability provides employment opportunities for individuals with a wide range of disabilities. Frog-Skin materials were invented by a NASA Langley engineer and developed for manufacture on the Peninsula.